There are many instances when both safety and streamlined forms of communication are critical for day-to-day operations. Not only does this revolve around issues such as theft or potential exterior threats, but the principle is just as valid for locations that require specific environments to be hermetically sealed. These are a handful of the issues which can be addressed through the Melaphone system, also known as ‘talk through glass’. Let us examine four specific circumstances which can better explain the benefits of this system. The modern ticket office, either for theatres or amusement parks usually, is associated with a great deal of foot traffic and obviously, the exchange of funds for tickets. A durable polycarbonate window provides superior transparency while this material is virtually impervious to unauthorised entry. Although the separation between the employee and the customer is quite secure, a mesh covering still enables both parties to communicate easily. The safety measures within a travel agents when dealing with currency is taken with the utmost importance. With a currency exchange kiosk, thousands of pounds, euros, dollars and various other currencies are kept at bay from prying eyes and potential fraudsters/thieves. 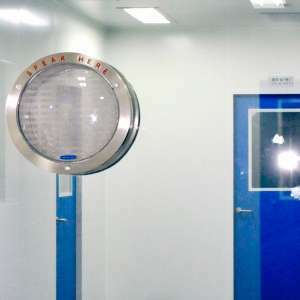 For that matter, hardened polycarbonate windows are installed to instil the ability to communicate with customers and to also view what both the employee and the customer are doing to enable noticeability of suspicious behaviour of any kind. It should already be quite obvious why banks would utilise the Melaphone system. The durability of the polycarbonate window affords superior protection against unauthorised entry. It is also an impact-resistant substance, and this will often act as a deterrent. Much like illustrated in the ticket office example mentioned above, this rugged framework will not hinder communications between the bank teller and the customer. A wide viewing aperture provides a greater degree of visual security; frequently required within banks and similar institutions that deal with financial transactions. One of the main intentions of any prison is to mitigate the chances of problems between staff and inmates. This is frequently accomplished by limiting and monitoring the degrees of interaction. However, there are still times when each party must be in the physical presence of the other. Examples can include barriers within secure housing units (SHUs) or when inmates purchase commissary from authorised staff. Not only is visibility key to avoiding potential problems, but the chances of a physical assault will naturally be much higher within such an atmosphere. The Melaphone system allows both parties to easily communicate with one another without risking physical contact or even a potential assault. 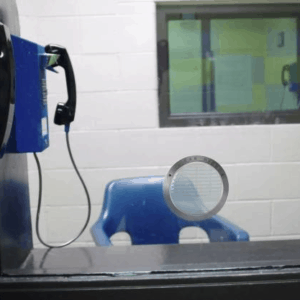 Another massive benefit that should not be overlooked is that Melaphone barriers can prevent instances when prison staff are assaulted by bodily fluids or other potentially hazardous biological materials. These are actually some of the most common incidents within prisons and the majority could be prevented with the help of this polycarbonate barrier. A receptionist’s desk within a doctor’s surgery deals with a number of vital factors. Prescriptions, patient details and medication information to name a few. Due to the importance of that area, talk through glass is often present to add security. It keeps important data safe and away from people who may wish to abuse it in some way. It also adds security in the way of protecting employees. Doctor’s surgeries can of course also inhabit individuals with mental health issues and so in the instance that someone can become violent, staff members are kept safe and are able to swiftly contact the authorities if necessary. The Post Office is another area where the exchange of goods, services and money occurs on a regular basis. Thus, it makes sense that a Melaphone system is put in place. All of the aforementioned benefits are offered, and employees can enjoy an extra sense of security when dealing with the general public. In this case, we should also mention that these units are highly effective at blocking dust and other particulate matter. This is an important point to highlight considering the fact that heightened security measures often tend to define modern post offices. These are some very common applications of the Melaphone system. Of course, there are many other potential uses for this transparent apparatus. It is simple to install, and all mesh guard covers can be easily maintained. 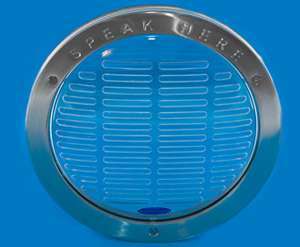 The circular speech window is supplied in either small or large dimensions; depending upon the application and the requirements of the customer. We are more than capable of adapting these units to suit the discrete needs of the customer. If you would like to learn more about Melaphone or should you have a specific question in regard to a certain environment, please contact us at your convenience. Melaphone specialise in the function of ‘visual audio’, committing their efforts to creating a bespoke Melaphone system for instances such as the ones discussed above. Melaphones are provided all over the UK and the world for various purposes, ensuring safety and security for different types of business. 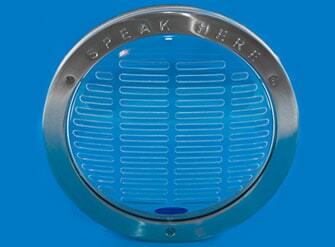 To discuss making an order or for a general enquiry about the Melaphone system you want, contact us today. You can call us on +44 (0)13 5923 3191 or alternatively, email us at info@melaphone.co.uk.